We got up nice and early for the HOW100 (Hope On Wheels). "Women’s only" ride benefiting breast cancer research, where 100% of the proceeds go straight into research.The only way men were alowed to ride was if they were on a tandem with a female. As a survivor, I got to sign the poster at the start. 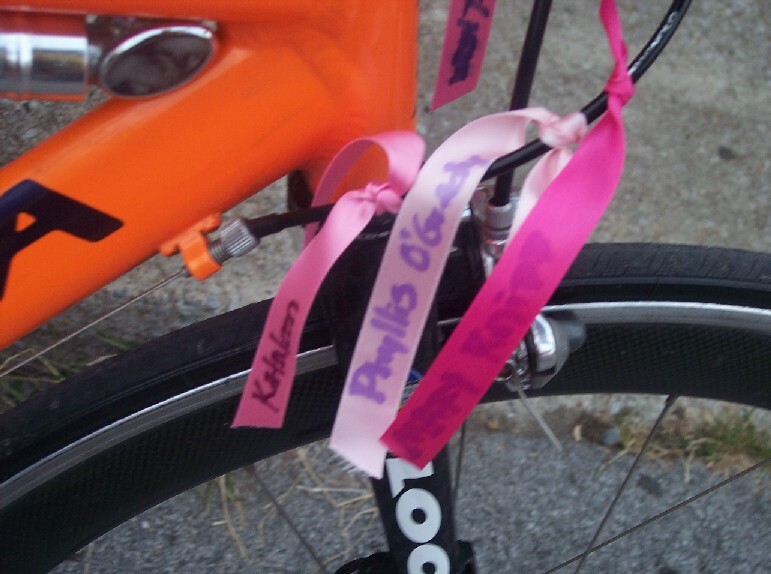 We all had pink ribbons that we could put names on and tie to the bike. I had ribbons for Phyllis (my Bosom Buddy), Kathleen, and Anne Mitchell tied to my frame… Thanks for riding with me Ladies! The ride was great! The Natchez Trace terrain was quite different than what we are used to riding in Indiana. The grade was fairly gradual, but long! 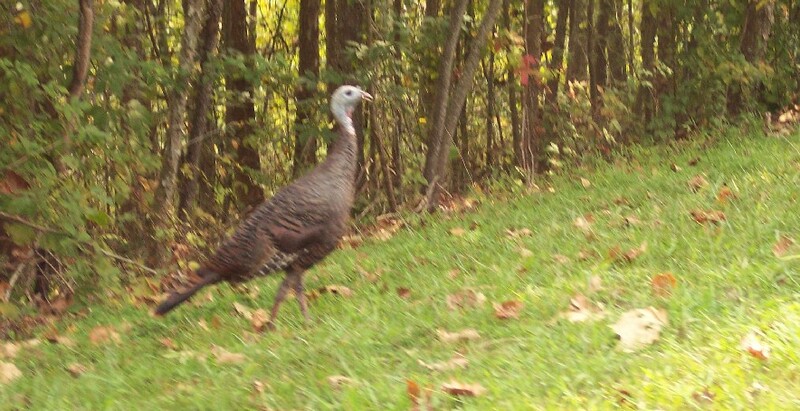 We are used to short steep hills around here. Not shallow and long. My ride was well over 9K of climbing. My Husband (Ken) and Daughter (Madison) rode tandem together, and I rode my single bike. They had over 450 riders and I shortly found myself at the front. I thought that it was going to be a pretty boring century if I was going to have to do it all by myself. Then a tandem came by cruising at about around 24mph and I latched on pretty quick. Staying with them on the climbs was no problem, in fact I generally passed them, but I had to work to stay with them on the descents. They would FLY down hill. On one descent I clocked over 47mph. Slide out of the draft just a little to the left or the right and you could definitely feel it! The support on this ride was like none I’d ever seen before. The snack stops seemed to be in competition with each other. And, they were staffed primarily by men!! I have to say that I was initially shocked to see the line of women waiting to have their tires pumped up before the ride! But then I chuckled. They had snack stops pretty much every 10 miles of the route. 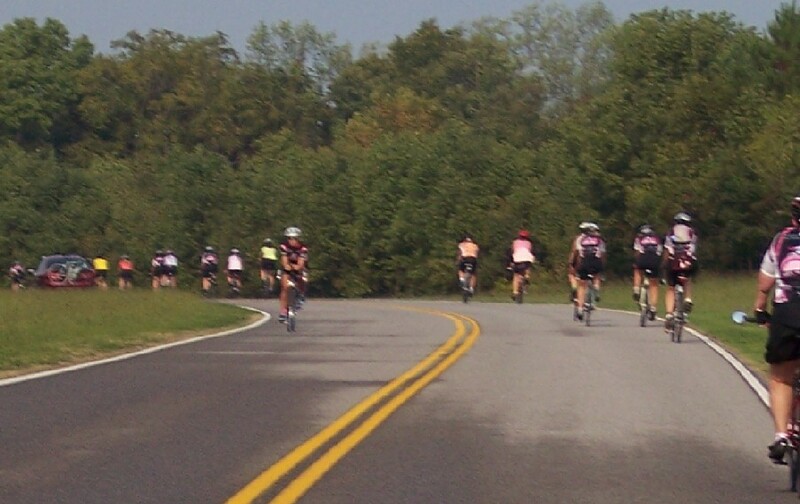 The route was on the Natchez Trace parkway and it was an out and back course. The snack stop at the 12.5 mile turn around (for the 25 milers) was the best. The men at this station were all wearing Hawaiian shirts with leis, giant electric fans, pink flamingos, Hawaiian grass skirts, Parrot head music and they served frozen Margheritas (virgin of course)… and, get this, they offered to hold your bike for you while you snacked and rested! Talk about pampered!! Then, on the road, we were constantly being passed by support people (more men) on motorcycles and pickup trucks. Rolling sag support. They would offer you handups while you were riding. Everything was perfect till mile 40 of the route. We just passed the 40 mile snack stop by about a mile and a half, when the surface of the road suddenly changed. I asked the tandem driver if this was going to be over with soon, and when he said it was rough like this the rest of the way to Alabama I knew I was not going to make it to the turn around for the 105 miles. My hands and feet (still effected by the peripheral neuropathy of chemo) were screaming at me, so I said my “goodbyes” and turned around. Went to the snack stop we had passed, put on some sunscreen, and found someone else who had decided to make it an 80 mile ride instead of 105 on this sunny 88 degree day. My new riding partner also liked to jam on the downhills, so like the tandem, I was working to stay on her wheel on the descents, but she was not much the climber, but that’s ok. I welcomed the company. It was kind of fun on the return snack stops to ask people if they had seen an orange tandem with a Father and Daughter on the tandem… “The girl with the long braid, shiny pink arms and legs”… “Oh yeah! The one reading a book while her father did all the work!” “Yeah, them! How did they seem?” “Oh, they seemed to be having a great time. I want to find someone who will pedal while I read”. I was very glad to be able to check on them…. As this was a National park, cell phones didn’t work at all! I was worried about how they were doing on some of the climbs. I was also surprised to hear that Madison kept her arm and leg warmers on in the 88-degree heat. I know I went through the water very liberally. But she was pretty determined to stay “in the Pink”. When we were done, Ken and Madison were waiting for me in the parking lot. Lunch was served at the school… but most of the “good” stuff was already gone. Ken said that is what people had reported on the RftR’s in years past when they did the century. All the short ride people got first dibs on the good stuff. It was a good ride. Would like to have been able to meet more people. I got the impression from Ken that I probably would have had I done the shorter route and slowed down a bit. Old habits are hard to give up. I was so glad that Ken and Madison were able to make it as well. 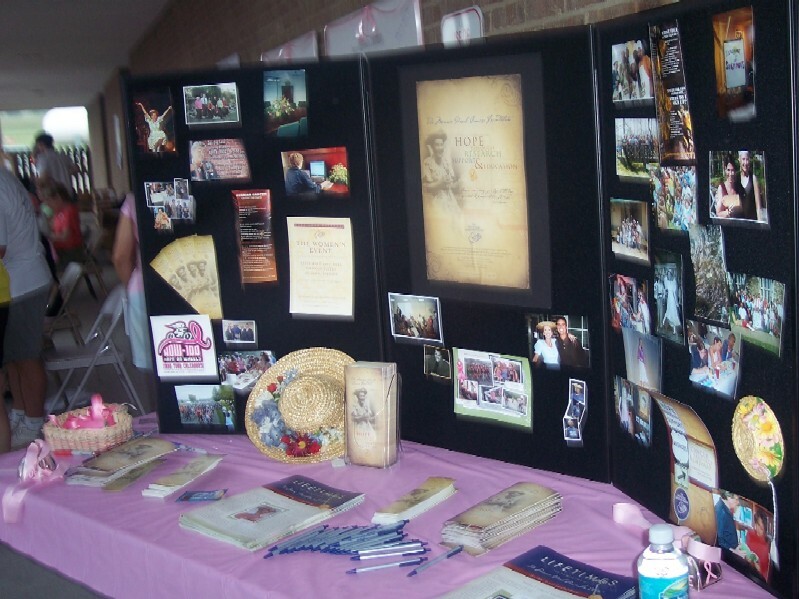 Well, We just got back from the HOW (Hope on Wheels) 100, the breast cancer fundraiser in Tennessee. It was held on the Natchez Trace, a former stagecoach trail, converted to a national parkway, 450 miles long, between Nashville, Tennessee and Natchez Mississippi. The ride catered to women (as it was a breast cancer fundraiser), and the only way to ride as a man was for me to ride a tandem with a woman partner. I occasionally ride with our daughter, Madison, on our tandem, so my plan was to do the metric century with our 11 year old daughter. Her previously longest ride on the tandem had been 40 miles, so this was a bit of a step for her. Cindi was going to ride the full 100 on her single bike. We drove down the night before, and stayed at the host hotel, which was about 20 miles from the start. As the ride started at 8am, I reminded the hotel receptionist that the riders would be expecting the 'complementary hotel breakfast' between 6 and 7 am, which caught them off guard, as they normally set up breakfast at 8am. Well Saturday morning, we pack the car and head for breakfast. It is about 6:30, and no they are still setting up breakfast. We got some cold cereal and fruit and headed off to the start. We arrive at the start around 7:15, and Cindi chats with a couple of people she knows. Around 8:10 we wonder when the ride is going to start, when someone tells us that we are on 'central time", and we have almost an hour til the start! Oh well, at least everything is all set. At the start, we have some announcements. There are 450 starters and maybe 20 tandems, and over $75,000 was raised. Then we're off! It's about a 1/4 mile from the start to the parkway, then a 200 foot climb to the parkway. 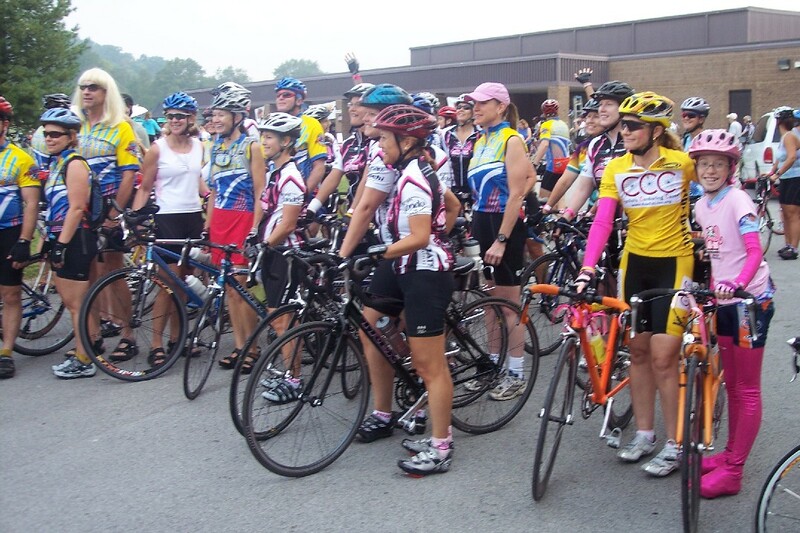 I see Cindi ride away on the climb with the lead group, and I settle in with our daughter for the metric century. I wanted our daughter to enjoy the ride, so I was planning on stopping at all the snack stops. Well, the first stop was at 6 miles, so we stopped, got some Luna bars, and headed back up the parkway. The weather was warm and humid, you could see mist in the valleys, and the humidity was so thick, you had the illusion that it was a cloudy, hazy day. The Natchez had nice roads, but no flats. We would always be climbing or descending. Generally the grades were shallow, at 3 to 5 percent. However at one point we left the Tennessee river watershed, climbing around 800 feet in a series of climbs around 4 miles long. 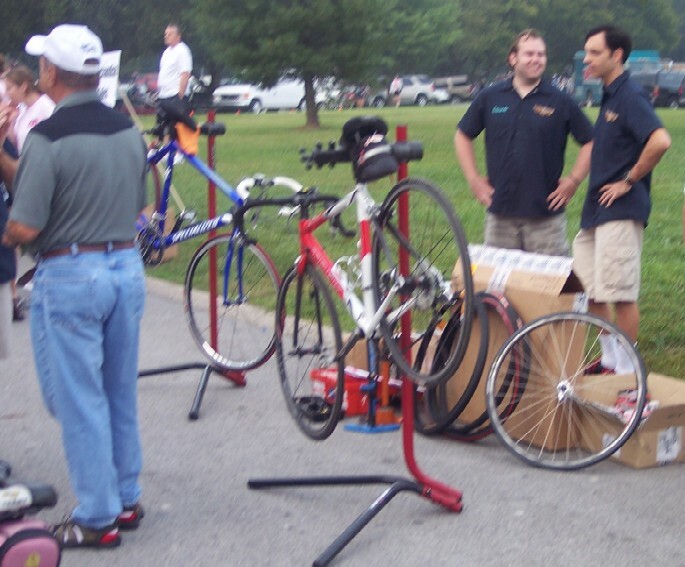 The local bike shop, Grand Fondo, was doing the sag and technical service, and they were EVERYWHERE! on motorcycles and vans. The haze burned off about 90 minutes into the ride, and the sun came out, warming up eventually to 88 degrees. The snack stops had been set up at scenic overlooks along the parkway, and there were a lot of stops. On the metric century, the snack stops were at 6, 12, 22, 33, 44, 51, and 57 miles. As I wanted my daughter to enjoy the ride, we hit all the stops but one. As mentioned earlier, I was concerned about Madison doing this new, longer distance, and I was worried that she would get bored. I had mounted a handlebar bag backwards on the stoker's bar, and she had stuffed it with a book, a game-boy, a camera, and her ipod. 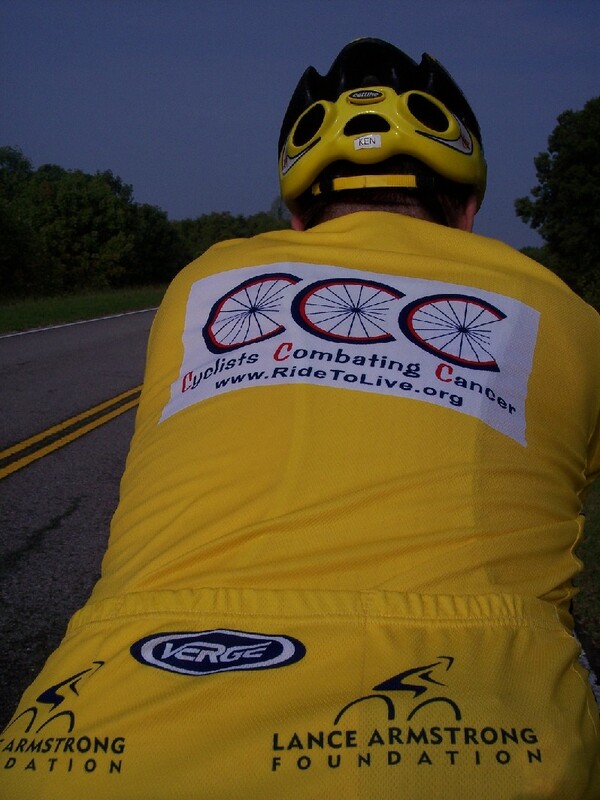 She also started taking pictures from the back of the tandem. Being bored, she took lots of scenery and asphalt photos. She did however take 2 photos I enjoyed. 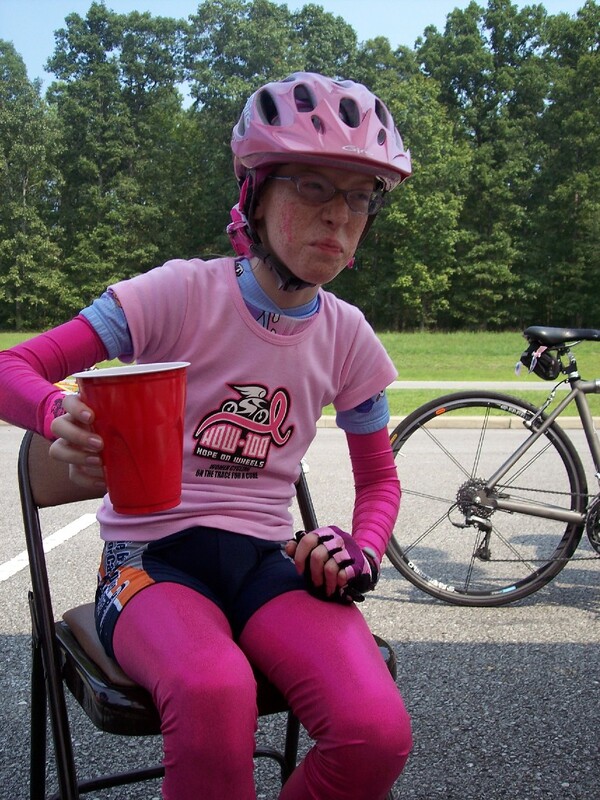 She had on her pink giro helmet, her pink shirt from the ride, and pink arm and leg warmers. 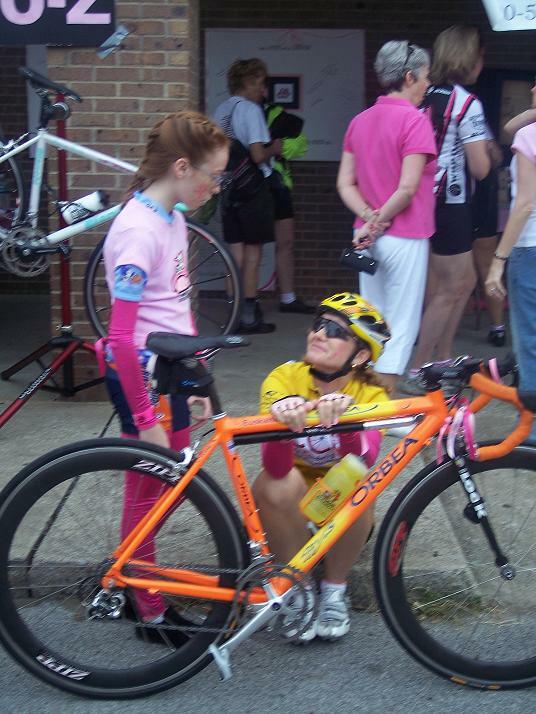 so she was a sight to see, all that pink, with me on the front on the tandem, wearing all my CCC yellow.. She got a lot of comments from other riders, for being the 'pink-iest' rider on the tour. On the final descent, Madison said: "What's burning"?, and I said: "Oh, those are the brakes, because the hill was so big, with a stop and turn at the bottom". At the finish, they had a pink balloon finish line, and an after-ride dinner put on by 'Wild Oats', a co-sponsor for the ride. All in all, a good ride, 62 miles in around 5 hours, including snack stops.